TICKETS: The Go Goodwin’s Manchester Storm are back in action this FRIDAY & SATURDAY (11th & 12th November), as we take on the Dundee Stars & Braehead Clan respectively, here at the Storm Shelter. Face off is at 7:30pm on the Friday & 7pm on the Saturday, and tickets can be ordered online or by calling the box office on 0161 926 8782, or in person at the box office. 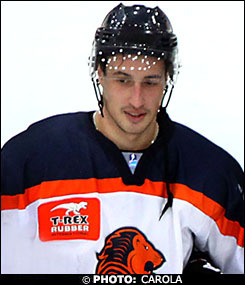 With recent injuries to the Manchester Storm line up, the club have moved quickly in securing the services of 26 year old, 6″1 Dutch International forward, Nardo Nagtzaam, on a 4 week contract. Coach Omar Pacha had the following to say about the signing, “Obviously last weekend hit us hard on the injury front, and with Adam Harding (broken foot) also still on the injury list, we needed to bring in some cover. I made contact with quite a few agents on Monday, and Nardo’s name came across my desk and i liked what i saw and was told. He has speed, a great shot and has played previously in the highly respected NCAA and EBEL. I’m glad we were able to get the deal done so quickly, and Nardo arrives into Manchester first thing tomorrow (Thursday) & is expected to be in the lineup for this Friday & Saturday nights home games, and our away fixture in Cardiff on Sunday. This is a great opportunity for Nardo over the next month to impress, and he is determined to do so. I’m sure all Storm fans will welcome him to the Shelter with open arms. Adam Harding is hopefully close to a return in the near future after suffering a broken foot blocking a shot in practice over a month ago. Darian Dzyiurzynski & Patrik Valcak- both players suffered upper body injuries last Saturday evening in the win over the Nottingham Panthers. Whilst we have not got definitive dates for a return to the lineup at this early stage, we are hopeful it will be around the 2-3 week mark for both players. DISCOUNTED TICKETS FOR REMEMBRANCE WEEKEND !